The school relocated to new modular accommodation in September 2014, making use of the former St Columba’s Primary School site. 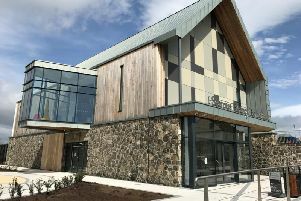 Speaking after he performed the opening, Minister O’Dowd said: “I am very pleased to have the opportunity to open new premises for Gaelscoil na Speiríní. “The school has been delivering quality education through the medium of Irish to children in Straw and the surrounding area for 10 years and has seen a steady rise in enrolment in recent times. Now the school has moved to improved premises in a better location and it is the start of an exciting new chapter.